Delicious skin on chicken breast. Golden brown, buttery goodness. Crispy skin, super juicy meat – this is chicken breast perfection! This skin on chicken breast is AMAZING. And I say that as someone who is NOT overly fond of chicken breast. I’ve been making chicken breast for many years now. I used to hate it with passion, thinking it was dry and bland. Until I finally learned how to bake chicken breast that actually came out juicy. But this. This golden brown, buttery goodness. The crispy skin, the super juicy meat. This, ladies and gentlemen, is chicken breast perfection! How do you get crispy skin on baked chicken? This recipe uses skin on chicken breast. To ensure crispy skin, I sauté it first, skin side down. Then I roast it in the oven until it’s fully cooked. The crispy skin is a delicacy! I’ll admit that my go-to chicken recipe is still the basic boneless skinless baked chicken breast. It’s just so easy and versatile. But when I’m inspired to invest just a little more in making dinner, this recipe s just wonderful. 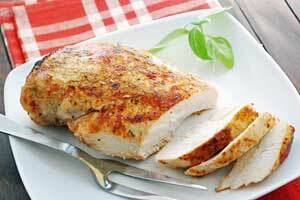 Is skin on chicken breast healthy? I believe it is. According to fitday.com, a 6oz portion of roasted skin on chicken breast has 400 mg potassium, 107% of your daily niacin requirements, and high levels of vitamin B6, phosphorus and selenium. It’s true that the skin is high in unstable omega 6 fatty acids. But it also contains healthy oleic acid and harmless saturated fat. What side dishes go with this recipe? Since I bake it in a 450°F oven, I like to serve it with side dishes that I can bake in the same oven. So I often serve it with buffalo cauliflower, with carrot chips or with roasted bell peppers. You can keep leftovers in the fridge for 3-4 days, although the skin does lose its crispiness. I usually remove the skin and shred the meat to use as a salad topping. Another option is to gently reheat the skin-on chicken breast in a 250°F oven. Heat the oven to 450 degrees F.
Pat the chicken breasts dry with paper towels and season them on both sides with salt and pepper. Heat the oil in an oven-safe skillet over medium-high heat, about 3 minutes. Place the chicken breasts in the hot skillet, skin side down. Cook the chicken breasts without moving them, until the skin is crisp and golden brown, about 5 minutes. Turn the heat off but leave the skillet on the hot burner for now. Turn the chicken breasts skin side up. Add the butter to the skillet – it will melt immediately. Swirl it into the pan juices, then spoon the pan juices on top of the chicken breasts and sprinkle them with garlic powder, paprika, and dried thyme. Transfer the skillet to the oven. Bake the chicken breasts for 10-12 minutes, until cooked through and an instant-read thermometer inserted into the thickest part reads 165 degrees F.
Remove the skillet from the oven and transfer the baked chicken breasts to a cutting board. Loosely cover with foil. Allow the chicken to rest for 5 minutes. 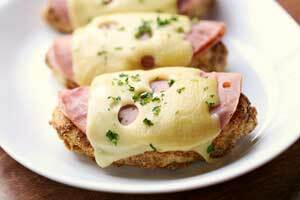 Slice the baked chicken breasts, arrange on plates, spoon the pan juices on top and serve.